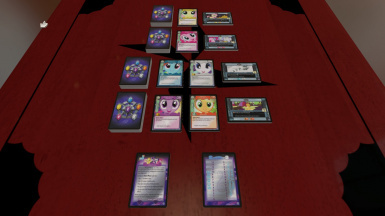 All four starter decks for the first set of the My Little Pony: Collectible Card Game, along with a save for the entire Series 1 set. This one is for all the Bronies out there! 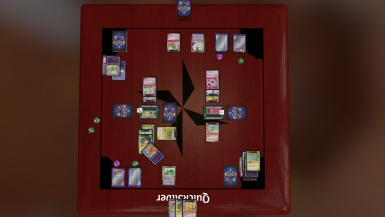 This is a save that has all four Starter Decks, ready to play. 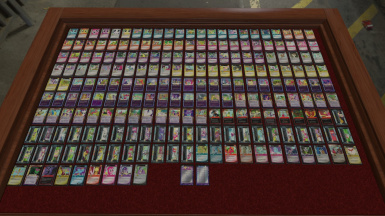 Each 45-card deck is lined up with their respective Mane Character(s) and 10-card problem decks. A stack of four each of Turn Cards and Score Cards are also included. There is also a save available for the entire Series 1 set and promos, for you and your friends to construct decks and play against each other! In the game's current state, there's no efficient way to have different double-sided cards each with different faces. I would have made separate 2-card decks for each Mane Character to try to get it working but it would be too much extra of a load on the software to load those extra decks. For now, each Mane Character is a 2-card pile. Each card in the pile has the normal card back, and the front side has one of the two faces of the Mane Character card. 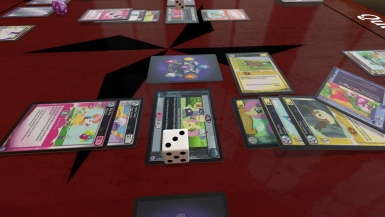 When playing the game, you could either place the Start card at home and the other card outside of play, or stack one on top of the other and swap order when its time to "flip" the Character, whatever works easiest. 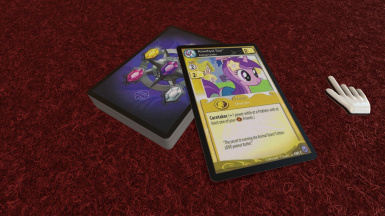 In the future if the developers make it easier to create double-sided cards, I will update these cards to convert the Mane Characters into a single double-sided card.